The Sharples N Grant Tuff Elephant Dog Toy is a super tough dog toy that's designed to withstand the very strongest dogs in pulling and tugging rough & tough games. 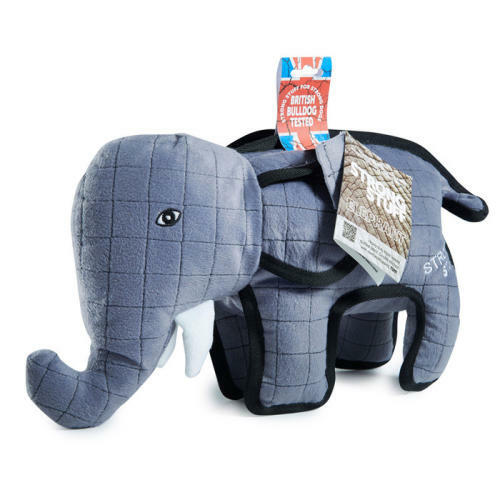 The Sharples N Grant Tuff Elephant Dog Toy is constructed from a super strength blend of 3 fabrics; a super strong faux velboa quilted top layer, nylon middle layer and a canvas base layer. When combined and quilted into a triple layer, double stitched and then given reinforced seams for extra security, an incredibly tough and durable toy is created. For added stimulation, each toy contains a squeaker, which itself is encased in a ballistic fabric, making it extra secure & safer for pets. This toy has been tested to withstand 150nm of arduous strain. This toy IS NOT suitable for use purely as a chew toy.